Working with our partners at Livedrive, we can now a secure, professionally managed cloud backup service for PCs and servers for just £10/month(+vat) per PC or server. Livedrive are one of the world's biggest cloud backup providers and their backup systems offer automatic cloud backup and unlimited storage with backed-up files available from any Internet connected device including PC, Android smartphone, tablet, iPad and iPhone. You can even retrieve old versions of files (as well as deleted files) for up to 30 days. Our new backup service is ideal for Tracker Lo-Start asbestos consultancies and other smaller businesses concerned about the security of their data. For more information, click here http://start-software.com/support/backups-livedrive/. All Start Software staff are "Asbestos Aware"! We've been working with our friends at Asbestos Academy to ensure that all of our programming and support staff have been through a training course and certification for asbestos awareness. They have all studied the on-line asbestos awareness training course and have all passed their exams too so congratulations team! If you need on-line asbestos awareness training, get in touch with Asbestos Academy and tell them that we sent you. This is a cosmetic upgrade to Tracker Web Server, the web portal for client access to asbestos data from asbestos consultancies and asbestos surveyors running Tracker or Alpha Tracker. This release has improved graphics throughout including file icons in the client document library. This is a cool upgrade to Tracker Web Server offering you a brand new menu style - much more interactive and "web 2.0" than the old one! The new menu style is an option so you can switch users between the two styles if you want. The new menu design enhances Tracker Web Server, the client portal for asbestos management (part of the Tracker family of software for asbestos consultancies and asbestos surveyors). I'm writing this on the train on the way back from one of my favourite cities, Glasgow. I have been up visiting an old client, a multi-national asbestos and environmental consultancy, to do some Tracker refresher training and system updates. Glasgow always strikes me as a city which has everything (architecture, night-life, culture, river) but doesn't realise how good it is! Our client's staff are always really friendly and it was a pleasure to run through the administration side of Tracker with them today. 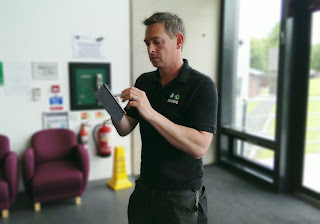 The surveyors are busy using Tracker Mobile to capture the asbestos survey data on their iPad Mini tablets but with new admin staff in place they needed to run through the Tracker processes for checking and producing the asbestos reports. In a couple of hours this morning we were able to cover the basics in Project Tracker and Tracker 264.
automatically producing the asbestos reports. We also covered invoicing from Tracker using Invoice Tracker and created a brand new link to the Microsoft Navision invoicing system. Alpha Anywhere (Alpha Five v12) launched today! Regular readers of the blog will know of our successful and developing relationship with Boston-based Alpha Software. 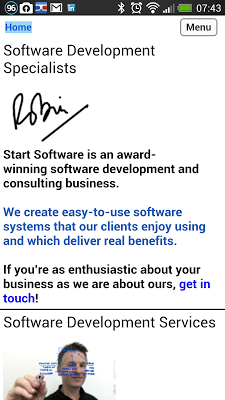 We are Alpha Software's UK professional partners. Alpha Software are the creators of Alpha Five, a product for software development businesses like ours which helps us to develop first class systems for the web and cloud. Our Alpha Tracker system for environmental and asbestos surveying is one such product enabling asbestos consultancies to access their systems from a web browser anywhere in the world. 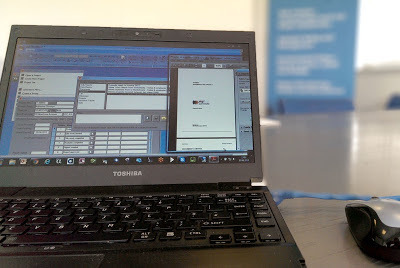 We are already using the Alpha Anywhere mobile technology in a number of our business applications for our customers. Can we help you too? Tracker and Alpha Tracker are famous for being the best and most efficient software systems for the asbestos surveying industry. Asbestos surveyors and asbestos consultancies have experienced huge increases in efficiency when switching from paper or other electronic databases and systems. An early Tracker asbestos consultancy improved their report turnaround time from 6 weeks to 4 days after switching to Tracker and Tracker Mobile (the on-site data capture module for Tracker running on Android and iPhone). Most Tracker customers use the software for other types of environmental report as well as for asbestos management, refurbishment and demolition surveys. An asbestos consultancy just called me to say that their use of Legionella reports within Tracker was going so well that - since switching from a semi-manual system - their standard report turnaround time had dropped from 21 days to 10! This news is great to hear and reinforces the message that Tracker is the most efficient system in the market for all types of environmental consultancy. AWAS Consulting have received their Alpha Tracker training today becoming the latest asbestos consultancy now live on the UK's leading asbestos surveying system, Alpha Tracker. AWAS are dynamic asbestos and energy management consultants, working across the UK with clients looking for quality asbestos survey reports and other asbestos services. They have been working with other asbestos software but have now chosen Alpha Tracker and its companion handheld solution Tracker Mobile to be their in-house asbestos surveying system. One of the strengths of the Tracker family is that it can be customised to produce asbestos reports in virtually any format and we have worked with AWAS to configure the system to produce reports automatically and which are virtually identical to those they have produced previously and via other software. Tracker Mobile is the only asbestos surveying system available on iPhone, iPad, Android smartphone, Android tablet and Windows Mobile device (or any combination!). AWAS are making use of this flexibility running Tracker Mobile on iPhone 4 and Samsung Galaxy Note smartphones. For more information about the range of asbestos surveying and consultancy services provided by AWAS, contact AWAS Consulting on +44 (0)1564 739367 or visit their website http://awasconsulting.com/. For more information on Alpha Tracker and Tracker Mobile, contact Start Software on 0845 612 2402 or via their website http://start-software.com. This release of Tracker Upload Manager (part of the Tracker and Alpha Tracker suite of software for asbestos consultants and asbestos surveyors) has a new feature. Previously, Tracker Upload Manager would text the surveyor once data had been received. With surveyors generally having email access on their smartphone or tablet, many clients had asked for this to be an option only (with emailing being the default method of notification). Tracker Upload Manager v1.0.73 SVN11 provides this option. Never in doubt... after Kim's hard work and preparation the success of yesterday's ISO9001:2008 review here at Start Software was surely a foregone conclusion! I wish... our latest assessor is quite tough and knows the software market well and so his reviews and assessments are a genuine challenge to us. did you know that all of our staff are asbestos trained as well as being software experts? we look for long-term partnerships with our tool providers including Alpha Software (US) and CreativityCorp (Australia) - these long term partnerships give us best access to their developers and mean that we can influence the products "from the inside"
he could not believe that we allowed you - our customers - to set the severity and urgency of the call... he said that this was unique in his experience! I am committed to this principle - in my opinion only you know how important a particular issue is and so you need the ability to determine our time-scales for resolving your issue. After a long day of reviewing, checking evidence, assessing compliance against the ISO9001:2008 standard and generally asking difficult questions he left with only one minor non-conformance found. Thanks again Kim for your hard work and thanks and congratulations to the team here at Start Software who work so hard day in and day out to meet the needs of our valued customers. We have our ISO9001:2008 assessor in today for his 9-monthly visit to unpick our processes and procedures. As far as I know, we're unique across software houses specialising in software for asbestos consultants and asbestos consultancies (our Tracker and Alpha Tracker range) in that we have two quality accreditations. We have ISO9001:2008 in particular for our support service and we also have the AccredIT software development standard too. Kim is busy with him now.... we'll let you know the outcome! This is a minor maintenance release of Tracker Web Server (TWS) with improved "logout" functionality working more efficiently on all browsers including Chrome, Internet Explorer, Firefox and Safari. It also has some major performance improvements (introduced in 1.5.427) which make certain operations at least 5x faster. TWS is our integrated client web service providing asbestos survey reports, asbestos registers, action management, compliance tools and document library facilities for clients of asbestos surveyors and asbestos consultancies using our Tracker and AlphaTracker product families. This is an important update to Tracker Upload Manager, part of our Tracker suite of software for asbestos surveyors and asbestos consultancies. This release improves the management of the log (.log) files it creates, saving you valuable disk space. Please contact the office to request this update. I'm delighted to announce that we have a new member of our team - Judy Key. Judy has been working with Tracker at one of our valued UK clients for many years in a role covering the use, support and development of our core Tracker software system for asbestos and environmental consultancies. 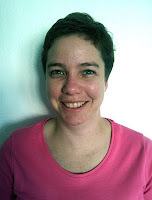 As we expand our software to the web/cloud based Alpha Tracker system for asbestos consultancies, Judy has joined the team to help us to develop our system and also to provide services to businesses in Australia where she is now based. Judy will also be providing out-of-hours cover to our UK and European clients as part of our 24x7 support service offering. Welcome Judy to Start Software! We really believe it is important to share our support statistics with you. The service we provide to you is vital to your business and it is key to how you perceive us. When you call you need to know that we will log every issue and question raised and resolve or answer it to your satisfaction. We try to do this every single time and in the timeframe you set us. All of our team do their best and we are successful most of the time - in fact, normally in 90%+ of cases. Last month we just hit the 90% target so in 9 out of 10 occasions we answered your problem within the timescale you set us. Considering we had 249 calls for assistance last month that's not bad but we'll strive to do even better in June. Monitor Environmental are a specialist asbestos surveying consultancy based in the East Midlands. Monitor Environmental have been a valued client of Start Software for some years and we always enjoy working with and for them. 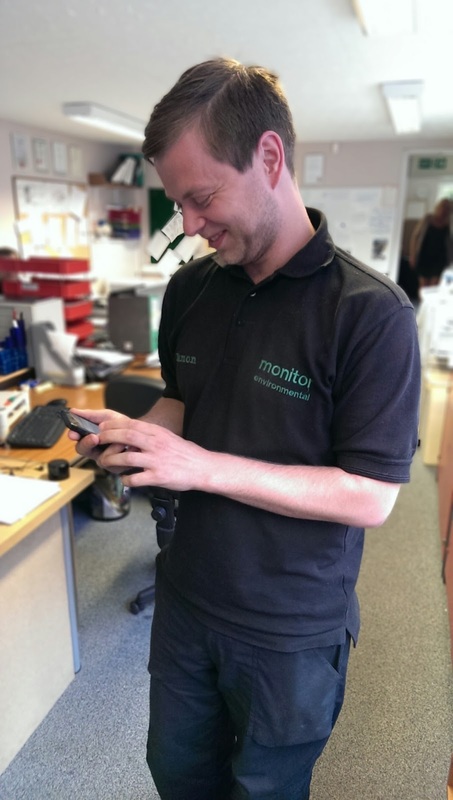 Monitor have used Tracker for some time and have recently upgraded to use the very latest iPhone asbestos surveying module (Tracker Mobile) using Mobile Data Studio 7.2. Yesterday we trained 8 of their staff in the latest surveying techniques using Tracker Mobile on their iPhones showing them how asbestos surveying data and photos collected on site could go straight into their Tracker system ready for lab results and report production. If you want to contact Monitor, click here to go to their website or phone 0115 939 4535. For more information about our range of asbestos surveying software, click here and follow the links to Tracker, Alpha Tracker and Tracker Mobile. Mobile Data Studio 7.2 (MDS) has been released by our partners CreativityCorp. v7.2 is a free update with important and useful new features. MDS powers our Tracker Mobile handheld data collection system "Tracker" for asbestos surveyors and consultancies and our other mobile data collection systems. We have been using the beta test version of MDS 7.2 for a few weeks but we are still not recommending that it be used in live mode by our customers until we have done more testing. Please do not upgrade your handsets before checking with us first. Any queries, please contact the office as usual. 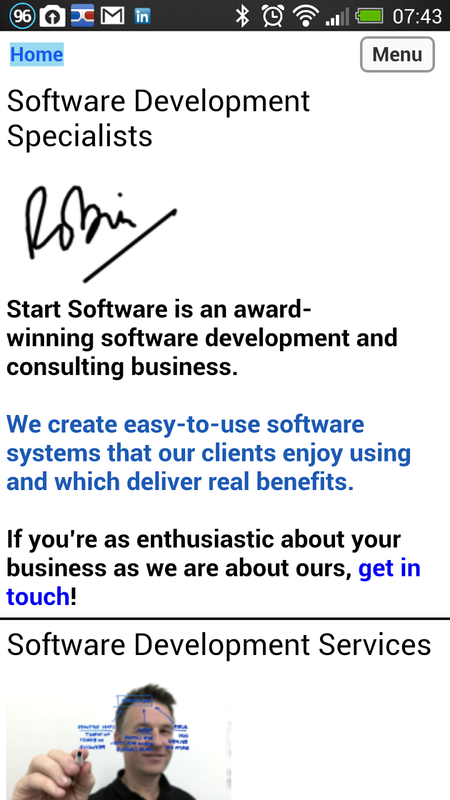 If you access our website at www.start-software.com on a smartphone you'll now see that shows a "mobile friendly" version of the site. Why do we or any other business need a mobile-friendly version of their web site? Smartphone screens are just not big enough to show web sites designed for PCs and laptops to their full potential and so smartphone-optimised versions of a site can be really helpful for users accessing the Internet when they are out and about. We think about the same issues when designing web databases and applications using Alpha Five. Alpha Five enables us to build web systems quickly and professionally but knowing the target audience (and their likely choice of hardware) is vital when we start a build. We can design for PC, laptop, tablet and smartphone and although the techniques are similar it is vital we get it right from the start.